In my last post, I explained with screen shots how Meribook Connect works and how it can help you 'share' your books with others. So, today I decided to do a demo video for Meribook Connect - the sharing feature of Meribook, and then realized it would be best if I show you the whole setup with my current landing page creator tool - Clickfunnels. So, here is what I am going to show you! Which is a 'book' you created inside of Meribook. 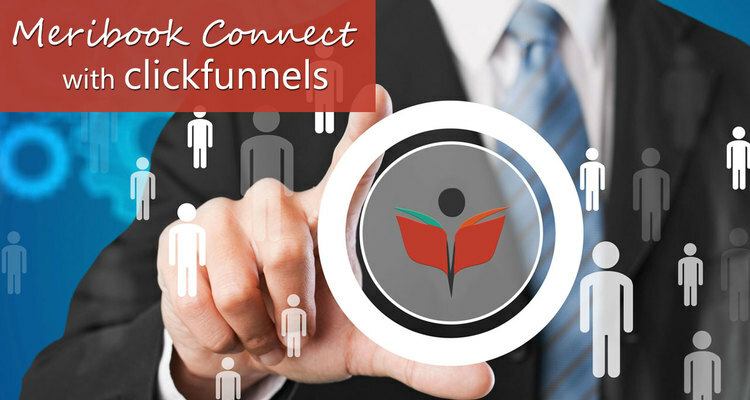 Using Clickfunnels as your landing page creator tool. Inside Meribook, as we take these "organized set of notes", you'll see they have real intrinsic value. These 'notes' now, can easily be delivered in exchange for an email id, if desired! In the video below, I show how to give access to "Facebook Marketing" Meribook 'book' as a "Lead Magnet". The user gets access to "Facebook Marketing" book, or our "lead magnet", with read only permission. Why not just create a PDF and email it as a "lead magnet"? Well, here are 5 good reasons to use Meribook as your lead management platform. With Meribook, there are no PDF design headaches and no additional design expenses. The "Book", already has a good standard structure, that anyone can follow. Book > Chapters > Sections. Inside Meribook, you can add "your Facebook pixel". Then you can learn who has consumed that information in the last X days. With PDF you can't do that. Desktops are cluttered with PDF's. As people sign up for more and more 'lead magnets', the less chance they have of coming back to your content, lost in some file folder on their PC. Update your "lead magnet" after delivery! You can update your Lead Magnet content inside Meribook. Yep, each Meribook - "book" can be considered as a "Mini Site for registered users", but without the hosting and user management headaches. So, there you have it, time to re-think lead management with Meribook! ALAUDDIN AHMED WROTE this on Jan 07 There are 0 COMMENTS.